What is the one thing that stands out when you think of a man cave? Is it a bar, a lounge, or perhaps a themed entertainment center? For me (and many others), it is the idea of a billiard table as a focal point when I enter the room. The biggest issue that many of us face in terms of getting a billiard table is determining which one works and if the cost matches the quality. If you don’t have a few thousand to drop on a single table, Fat Cat has a few great options that have a great value for a smaller cost. Let’s take a look at a few billiard table reviews for the Fat Cat billiard brand! With so many pool tables out there, choosing the best one can be daunting. While spending days upon days researching different styles and wood patterns, I happened to stumble across the Minnesota Fullerton style billiard table- a classic combination of modern and rustic. When I think man cave, I think a nice mahogany or chestnut finish on my furniture. Realizing so many people out there with the same preferences are looking for pool tables, Fat Cat capitalized on this with the creation of the Minnesota Fullerton table- a nice mix of a professional grade red cloth and a rich chestnut finish. The combination of an amazing billiard cloth with the elegance of the chestnut wood allows you to place this billiard table in your man cave regardless of whatever else is in the room. Quite often we have to purchase products that tie into everything else in the room, but this table enables you to bypass that hurdle. Chestnut can match both old and new, rustic and modern- enabling you to have a great centerpiece without the eyesore of a random out-of-place look. Additionally, this table comes equipped with synthetic leather pockets. Unlike cheaper billiard tables, the Minnesota Fullerton keeps the sleek leather look without compromising overall pocket purpose. 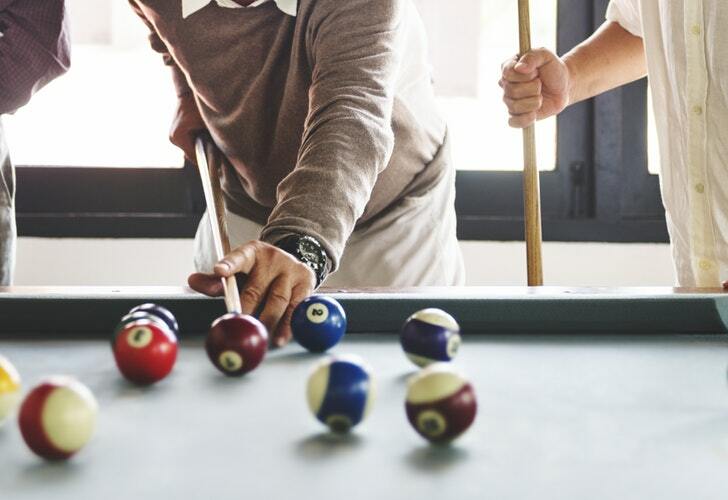 Most billiard tables have converted over to rubber pockets- this creates a higher bounce back should you hit a ball into a side or corner pocket at a higher speed. Leather pockets are a bit more forgiving, allowing you to have a little leeway in terms of cue stroking. Also, rubber looks tacky as hell whereas leather has extreme eye appeal! If you are looking for something a bit lighter in weight and easier to assemble, we have a great option below for you! Not everyone here likes the wood finished look, preferring a more unique look or perhaps a dark finish. The Minnesota Fats Covington pool table has an amazing black wooden finish on the table exterior and legs, creating a sleek finish without the generic wood-like appearance. Combine this with the camel color wool cloth and you have the dark versus light finish that appeals to all men! If any of you out there reading this are like me, you aren’t a fan of the generic green or red billiard cloths. Fat Cat did a large amount of research to find the most appealing colors out there for man cave purchases and discovered that the camel color cloth is the ideal match for the black billiard table. Consider this, when you purchase a car or look at different car models on line, the most appealing to many is a black car with a beige interior finish. They (Fat Cat) has converted that ideology into their pool tables and create an amazing looking table at an affordable price. Lastly, the Minnesota Covington has is a bit lighter than most billiard tables, allowing you to move it without worrying about where the nearest chiropractor is! What can be better than a lighter pool table you ask? This table, unlike any other on this list, takes only an hour to assemble! Most tables require multiple people to assemble it, but with the simple instructions, this can be assembled in a matter of an hour or so without hardship. If you can get past the fact that this pool table and all its components come in multiple boxes (sometimes a day apart), then this is a great option for you! Table weight isn’t an issue for everyone- if you are one of those who don’t mind how much the billiard table weighs, then let us take a look at our highest rated billiard table out there! If I could type in the Anchorman voice while describing this table I definitely would! Rich mahogany, French design, and a wool-blended cloth provide a look that screams rustic. Rather than your traditional green or red cloth, the dark, wool cloth provides a unique look that appeals to all desires. Unlike many billiard tables, the Frisco billiard table has a guaranteed warantee of 7 years! Most pool tables have a short warranty (if they have one at all), resulting in things breaking down a year or so down the road with no assistance. With the 7 years of warrantee guaranteed, you have the comfort of knowing that Fat Cat stands by this product and guarantee a long life with little to no issues. Combine the warantee with the cheaper cost of this table and there is no reason this table shouldn’t be near the top of your list! Although there are so many positives regarding the Frisco billiard table, it is a hefty project to take on in terms of building it. We mentioned before how the Minnesota Convington billiard table has a short assembly time (about an hour) – well this one is a bit more extensive, often times taking a few hours to assemble. If you set aside a half day to assemble a pool table to begin with, then this is a minor issue (or no issue at all). Also, the Frisco pool table uses rubber pockets. I have mentioned how I tend to sway away from these due to the look and “give” of rubber versus leather, but this table is the lone exception to this. The pockets look like they are high grade and provide the right amount of give in relation to pool balls, negating all of the factors that would lower rubber issues. Lastly, this amazing billiard table has warp resistant cloth and adjustable leveling pads, allowing you to avoid potential aging issues from extensive use. Most house foundations built over 20 years ago are dipping to one side or the other, causing issues in a variety of areas for homeowners. The adjustable pads provided with this billiard table allows you to adjust any of the legs to create an even pool table for your man cave! For our final review, let’s take a look at a hybrid table – a pool and air hockey combination! We have already dove into the top three billiard tables created by Fat Cat, but there has to be other options right? If you have a man cave that you will have younger guests enter, you may be looking for something a bit more in terms of options versus flooring space. Fat Cat has created the Black Pockey Table, a hybrid of sorts that has one side billiard table and one side air hockey. In terms of the billiard table, the felt cloth and adjustable legs mirror the quality of the Frisco table. The one fault I have in terms of the billiard table is that the cloth is a generic green and the bumpers a cheaper rubber. This table basically substitutes a lot of the quality for the ability to create a dual platform table. The air hockey side of this billiard table is actually really nice. There are air blowers on each side that allow proper puck movement across an even, glossy surface. If you have kids at home who may venture into your man cave, then this is the best option to allow them to have a game to play with without damaging your pool table for when you have the boys over for a man’s night in. Which Fat Cat Will Be Yours? Everyone has their own preferences in terms of what type of billiard table they are looking for. Whether you are looking for a chestnut, mahogany, or black wood look, these are truly the best options out there. Green, camel, wool, or red cloth availability grants you access to set your pool table apart from all others. Lastly, if you are looking to consolidate space and have a two-in-one table, the pockey table is an exceptional option for you! If you have any questions or comments on any of these products, feel free to leave them in the comments section below! Interesting options. All of which, I’m sure, are better than what I grew up with: a table that was in the basement and not with a slate foundation; eventually it was more like playing golf, looking out for the hills and dips, than playing on something that Fats would have competed on. I had a similar experience growing up. Nowadays, there are so many options out there for pool tables, but there aren’t many that vary from your generic table. Fats has a great selection and their tables are recommended across the board. We often learn from our pasts as to what we can or can’t do differently – in this case we have the option to choose a billiard table that fits us and provides us with the entertainment we always wanted. I need a new pool table actually and the lads will be joining me for Christmas this year in my brand new MANCAVE. I want to make sure it’s the best of the best and I think the Minnesota Fats Fullerton Billiard Table is going to do the trick. Price will not be an issue for me. That is an amazing table and I completely recommend it. The look, feel, and overall value of it is perfect! For me, it’s the Minnesote Fats Fullerton table all the way, as I’m a big fan of dark chestnut wood. The red cloth is also more appealing than the other options. I also like the green cloth, but I don’t like the overall cheaper looks of that table and certainly not the rubber bumpers. Thanks for letting me know these options! I agree, the Minnesota Fat Fullerton is amazing, particularly due to that chestnut. I have always been drawn to poo tables that stray away from the basics and have some uniqueness. Red or beige typically sticks out to me more-so than the basic green. I am so happy I have just come across your article. I move house 4 days ago and my girlfriend has agreed to turning a room into a games room. It took many months of convincing :-). I have always wanted my own pool table but do not have the slightest clue on what one to get. I really like the look of the Fat Car Frisco Billiard Table. I am so happy your girlfriend is allowing you to have a gaming room! The Fat Cat Frisco table is awesome for your game room. Its mahogany wood is amazing, and the weight of it allows you to place it without the worry of it moving as time progresses. It truly is one of the most visually appealing ones on here! Thanks for the great and informative reviews! If only I had the room to put one in my house. I noticed that the Fat Cat Black Pockey Table – Billiard & Air Hockey is the smallest of all the tables you have mentioned. Do you know if they offer anything smaller than this, or if its even a good idea to go smaller? I love going to the pool hall every once and a while and would enjoy having a table to practice on at my own house. once again thanks for creating this amazing review! There aren’t many pockey tables out there that go smaller, as they don’t allow you to have that full pool table feel. I wouldn’t go smaller, as you would lose out on the true billiard aspect, it would just be a small bumper game. Also, if you were to add this pockey table, it would allow you to practice your pool skills for when you go out to the pool halls, and give you the variety of air hockey to mix things up! My husband has always been fascinated with the Fat Cat Black Pockey Table which I never really approved of here in our house. After looking at the options you proposed, I will definitely consider getting the Fat Cat Frisco Billiard Table as it is a little more appealing to the eye, but still manly enough to make it all the way to my husband’s man cave. Thank you so much for this review! I love the Fat Cat Frisco table! The color uniqueness combined with the overall capabilities is perfect. The pockey table isn’t for everyone, but the Frisco table can appeal to all who need a pool table ! The Fat Cat Frisco one seems to be a very good one, it has kind of vintage in it, which would be perfect for our house. Now, I enjoyed to see all the different options, when I was little, we had a standard one, with the green “tablecloth” covering the deck. It was a while ago since I played it, also because the lack of space. Now with the new house we have, I really want one again. I will certainly check that table out, because I really like it. The Fat Cat Frisco table is beautiful. I love the wood veneer mahogany and the colors would really go nicely with my hardwood floor. The price point seems reasonable and the 7 year warranty is great. It’s too bad the pokey table isn’t the best of both worlds when it comes to quality but still looks to be a great piece for the kids. I definitely agree that the different color felts are much nicer than your standard green felt. Your reviews have really turned me onto the Fat Cat brand. I have bookmarked your website. When I am ready to add a nice billiard table to the house I’ll be back. I am a huge hardwood floor guy, and you are so right that this mahogany table matches it perfectly! The pocky table is lesser quality in terms of comparing it to full pool tables, but that is due to easy versatility between the two games. Can’t go wrong though with the Fat Cat brand! Hmmmmm. The Fat Cat Frisco Billiard Table really looks classic and unique. Not only is the color not too attractive and calling for attention, but the color of the board also rhymes with that of the external layer and four different legs. This particular Cat is truly unique and I love anything which is different. This table is definitely worth more than a thousand dollars, and when checking out the price, it was slightly more, as I had anticipated. I love the way you presented the facts which made it really easy to pick one. I completely agree with your assessment of the Fat Cat Frisco. The price is a bit high for some, but the quality is extraordinary. Hopefully it has all the options you are looking for and its uniqueness is up to your standards! Being a cat lover the title of your post Fat Cat Billiard Tables caught my eye and I had to laugh. In 2016 I was invited to the U.S. by my better half. In 3 weeks we drove more than 3000 km visiting 5 States. Beside seeing wonderful things I was also introduced to billiard. He ofcourse beat me as I was and still am a newbie to this. I must say it was fun and I would like to practise, perhaps one day I will beat him, who knows? Recently he has been talking about getting one for the house.I fully support this idea so I will show him your post. Lots to chose from but probably we will settle for one of $$ and see if we really become passionate about it. Then there might come the moment that we want to upgrade. Thank you for this detailed report, it will be very helpfull. I love the irony of being a cat lover and these being made from the Fat Cat brand! Any of the options here will fit your needs, but the $$ option does seem great for you! Whatever option you and your better half decide on, you will get a great product and a great service! Billiard tables, something that I have not thought about in many years. I can remember a time back in my late teens and 20’s when I spent many an hour on the slate. I was raised on a ranch outside of the city and the family of a friend my age down the road purchased one. They put it in the garage. So you could call this my first involvement in a man cave. The Fat Cat tables look pretty impressive. Would be interesting to see if I could even still shoot straight. It has been many, many years. We all run into that rustiness after going years without playing. If you are worried about being a bit rusty, I would recommend something with rubber pockets, as the added bounce will allow the practice of missed shots without the absorption of hitting the ball all over haha. Those are some classy pool tables! I’m partial to the Minnesota ones because that’s where I live. 😉 I love the first one the most. Whenever we move again, I’m sure my husband will want a tripped out basement. Pool would be fun! We have a bumper pool table right now (antique my husband inherited from his grandparents) but unfortunately we don’t have a user friendly spot for it right now. I think I’d rather have a full table. If there were tables where I am from, I would be a bit partial too! I like the full tables, as the look adds value to the room and the capabilities are amazing. Bumper pool is fun though! Hey there! Thanks for compiling these awesome billiard tables. I always enjoy tables that have multiple games on them. Keeps things interesting that way although pool is a pretty exciting game in itself. Naturally, I like the Fat Cat Black Pockey Table Billiard and Air Hockey Combo Table. Air hockey is also an exciting game so I think between the two and whatever is playing on the big screen, the man cave will stay pretty active for a long time! The Fat Cat Pockey Table is awesome, as the air hockey aspect is just as good as a table that only has that as opposed to this dual feature table. It is a flash back table to when a lot of us used to play the game at arcades as kids! We had a table when I was young and at home. Don’t remember what make it was, but it was a beauty and my friends and I would play almost everyday after school. Unfortunately my father sold it when he sold the house. I’d tak the Fullerton for the look of the wood and the red table. I think the red would suit me more after having green for so long. The Fullerton Fat Cats table is amazing – the color pattern and capabilities is amazing and you can’t go wrong there! You nailed down some nice man cave billiard options here. I admit your first line of the article sums up my feeling when looking at tables. Absolutely daunting…so I appreciate you taking time to research and give details on each of these. For the money it looks like the Fat Cat Frisco is a good value and is in the sweet spot for me. I see that on a few of these they have a Dur-A-Bond playbed…maybe you mentioned it in the review and I missed the details…but what is that? I’ll pass along your site to my brother-in-law who is paralyzed right now while shopping for a new billiard table. The Fat Cat Frisco is an awesome table with so much to offer – I couldn’t help but reference it! The Dur-A-Bond play bed is an option that adds durability and longevity to the pool table that most companies can’t compete with. I definitely recommend it! I always imagine man caves as having a huge sound system, giant TV, and a billiard table (is billiards the same as pool? ), plus a bar. These fit right in with what I have in my head. If I were a guy, I’d be adding the Frisco table. That looks really snazzy and would go with my imaginary man cave wood paneling. Billiards is the same as pool! The Frisco table is one of the best options out there, and pairing it with a giant TV and bar would be amazing. These concepts apply to a she-cave or a house in general if you were looking for one!